Event Date: Saturday, 21 May 2016 at 11:00 a.m. 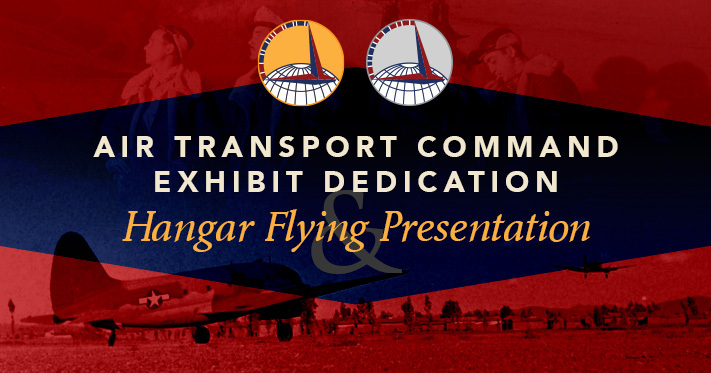 Surviving members and families of the WWII Air Transport Command (ATC) will gather in Dover on May 21st to help dedicate a new exhibit at the Air Mobility Command Museum (AMCM). A direct ancestor of today’s Air Mobility Command (AMC), the Air Transport Command established around-the-world delivery of high priority war materiel and critical personnel, a mission AMC continues to this day. The ATC Association, a group of veterans of the Air Corps Ferrying Command and Air Transport Command units of the US Army Air Forces (USAAF), approached the AMC Museum offering to help fund a new exhibit and to donate significant artifacts to the museum in order to help preserve their heritage. As the only museum in the United States dedicated to airlift and air refueling, the AMCM agreed the suggestion was a perfect fit for both organizations. According to Director Mike Leister, there are hundreds of stories the AMC Museum works to tell, but budget and staff limitations result in only a handful of new exhibits being created each year. By having the original ATC members contribute information and artifacts, that process became easier. And, by funding about half of the construction cost, ATCA allowed the museum to move forward to get the substantial exhibit done in time to perfectly coincide with the 75th anniversary of the official formation of the Ferrying Command on May 29, 1941. Jack Kinyon, at 93, is one of the original ATC veterans planning on attending this final reunion and dedication ceremony. First an ATC military member, and then an ATC civilian “Flight Traffic Clerk,” in a job that is known today as a Loadmaster, he will make a “Hangar Flying” presentation of his experience in worldwide airlift on May 21st at 1 pm as part of the weekend’s events. The public is invited to attend all activities, in addition to participating in the AMCM’s scheduled special Open Cockpit Day Event beginning at 9 am on Saturday, May 21st. The exhibit opening ceremony will take place at 11am in the main AMCM hangar. Visitors will be able to talk with veterans and learn from the people who ‘wrote-the-book’ on air transport.